Last Updated: July 16, 2015 | Subscribe to our weekly newsletter! While many people take the extra time to check the water quality of their hot tub on a regular basis, many often forget that the water isn’t the only thing that needs to be cleaned. The inside shell of your hot tub often doesn’t get as much care as the other parts of your tub simply because most of the time your hot tub is filled with water. However, periodically you should take the time to clean the inside shell of a hot tub to make sure that your hot tub remains clean and safe to use. When your hot tub is filled with water, you can’t really clean the entire shell. But that doesn’t mean you can’t clean the part of the shell that is above the water line. Using a cleaner that is safe for your water, gently wipe away the shell above the water line to remove any scum or dirt that has begun to accumulate around the sides of your hot tub not immersed in water. This little cleaning trick should be performed every one to two weeks depending on how often you use your hot tub. This will keep the top of your shell looking its best and make it easier for you to clean later when you are ready to perform a true deep clean of your entire shell. Every three months you should drain all of the water from your hot tub and perform a routine, yet thorough cleaning of your entire tub. This helps flush your system of any debris or mineral buildups in your hot tubs plumbing lines as well as the shell. To perform a full cleaning of the inside shell of your hot tub, just follow these steps. Drain all the water from your hot tub. 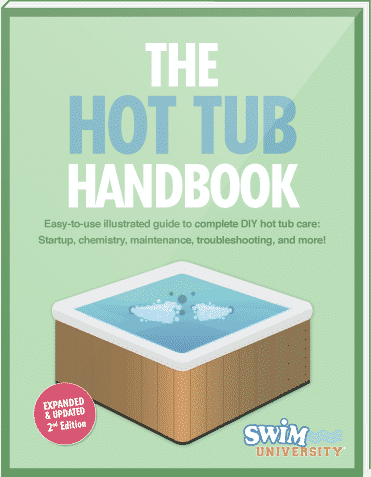 This should be done every three months or so depending on where you live, how often you use your hot tub, and the requirements from your hot tub’s manufacturer. Using a soft cloth or even special mitts designed for removing scum from the surface of a bath or hot tub and a cleaner such as Acrylic Brightener, gentle wipe down your entire tub removing any stains, mineral deposits or scum lines you see. Start on one side of the hot tub and be sure you cover every single inch of your shell during this process. Using a different cloth or mitt, apply a polish such as Thermo Gloss to the surface of the entire shell. These polishes will bond chemically to the surface of the shell providing a protective coating that is durable, hard and glossy. Be careful not to smear or streak the polish. Once applied, it will seal the surface of your hot tub hiding any minor scratches making it look new again. While the water is drained from your hot tub, you should also devote a little extra time to other parts of your tub as well. In addition to the shell of the hot tub, you should remove the filter and clean or replace it if needed and you can even take the time to flush out the pipes of your tub to remove any dirt and grime that has built up over time. While a clean inside shell is vital for a clean hot tub, you shouldn’t discount the outside of the hot tub or the cover as well. While you are performing your hot tub cleaning, why not take the time to clean the outside of the hot tub so it looks its best? Your cover could use a little attention as well. Remember, all year long your cover is defending your hot tub from debris and other dirt and it can take a beating in the process. Using a safe cleaner, wipe down your cover to remove anything from it that could dirty your water or even damage your cover. Performing a thorough cleaning of your hot tub’s shell is one of the best ways you can make your hot tub look brand new again while also extending the life of your hot tub. It is a good idea to clean the inside shell of your hot tub once every three months and if you do, you will find that your hot tub will run better and you will have a much easier time maintaining superb water quality in your hot tub so you can enjoy it all year long. You test your water, add chemicals, and clean your spa from time to time. But what else could you be doing to make those maintenance chores even easier?